Too Cute Tuesday is a craft, a cocktail, and friends. To learn more check out the Facebook page or check out the cooking related Too Cute Tuesday posts in the archives. 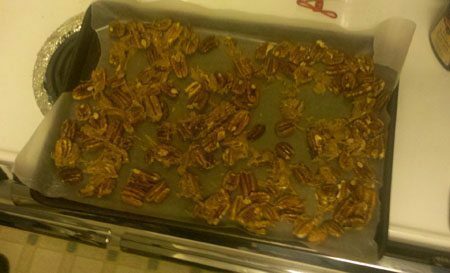 Candied pecans cooling on the sheet, absorbing their own deliciousness. 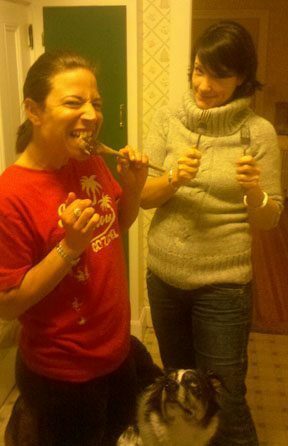 Jen and Dorrie taste our wares, and Sparks hopes they’ll drop something. Twas the week before Christmas, and everyone was stressed, so we gathered in Dorrie’s kitchen to make a mess. The sugar was melted on the stove with great care in hope that tasty nuts soon would be there. 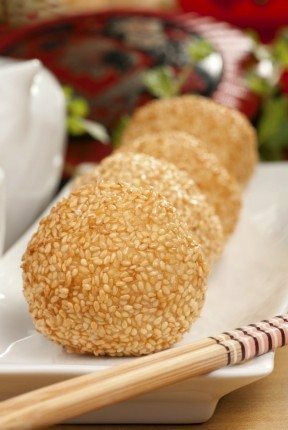 Soon all were gathered to sample the treats, so crunchy so tasty, salty yet sweet. OK, I’ll stop rhyming now. But the nuts were great and something we’ll do again I’m sure. 1. Queue up the recipes. Recipes one and two need to have the pecans seperated quickly so have the parchment paper, forks, and helpful friends ready. 2. Cover three cookie sheets with parchment paper. 3. Roast nuts in a 350 degree oven for about five minutes. 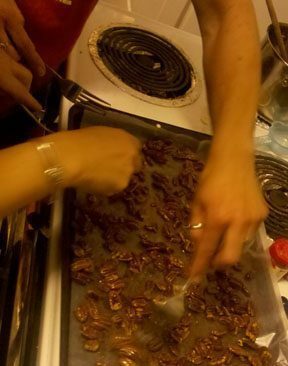 We used pecans but Dorrie made a batch of almonds after the fact for her dad and they were also great. 4. Prepare coating of your choice. Coat and separate on a cookie sheet. Let dry. Yum. Of the recipes, #3 had the best coating and overall consistency. Number 1 was clumpy and not so uniform and number two was better if only because we roasted the nuts in the oven precoating (note: this does make a difference). Anyway, these nuts can almost make a salad tolerable and they make good presents when you put them in little jars. Aren’t you crafty, and festive? Happy Holidays from the Too Cute Tuesday crew!